Disable the 'Link preview' and then add it to a feature branch. We will resurrect this at a later date. I wonder if we should rename quickLookup to linkPreview? Renaming to Hovercards would at least give product consistency..
@bmansurov Can you attach a screenshot? @bmansurov can we play with this somewhere before promoting to beta? Also, I think event logging akin to what they have done in apps (check with @Dbrant) is a crucial blocker to successful promotion to stable. 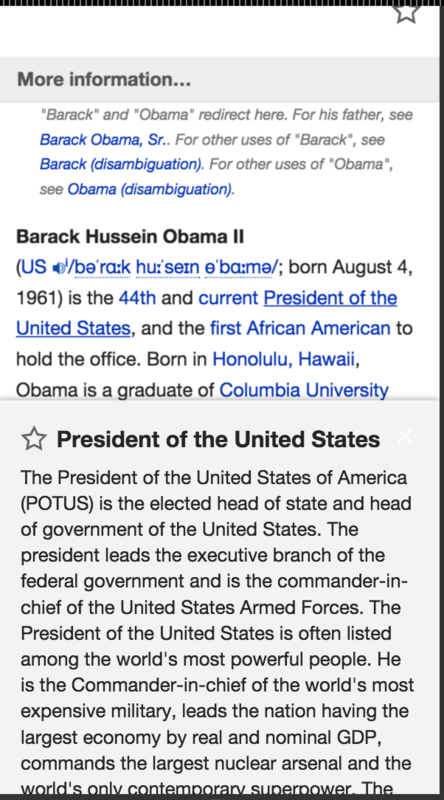 @JKatzWMF: Yes, you can test it on your phone by going to https://en.m.wikipedia.org/wiki/Barack_Obama?mobileaction=alpha and swiping over a link. Yes, I forgot to apply your patch, @Florian. How is this going? Moving to next sprint's code review to give it eyeballs! I've created the Hovercards epic (T111329) to track reasoning around and design/eventual resurrection of the hovercards feature. • Konfused-Kitten mentioned this in rEMFR2e5229b5f590: Temporarily kill hovercards until we can work out the behaviour.